I cannot tell you how a relief it was to get away from my normal reading pile and select books to read something I might have never read before. COMICS! Yes please get excited because if you want to see a grad student smile because he gets to read comics, well ask me for a pic and I will send you one. I was so excited to be asked to read this book that I had to drop everything to see what it was about. This was a cute collection of short comic stories focusing around the idea of lunch. We get various stories from various time periods and each one proved to be more engaging that the next. I don’t know why but this reminded me of the time when I had to create a short comic in one of my high school English classes. So adding to this, I wonder if this would be a great tool to use in classroom to explore the topic of various literatures and creative writing. 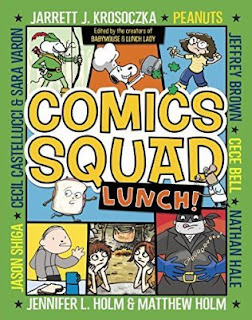 If you want a short break from your normal reading schedule and have some time for cheesy comics that will make you smile and laugh, check this out. I am excited to read more comics and get out of my comfort zone of reading.